K9 Storm's canine armor and communication systems help keep working dogs safe on the front lines of wars and police actions. K9 Storm makes custom vests, like the harness worn by this Special Forces dog. Wireless electricity, invisible speakers, a mind-reading headset -- see what America's entrepreneurs are creating for release in 2010. (Fortune Small Business) -- It's a tough world for man's best friend. Patrol dogs dodge bullets every day at home and risk their lives sniffing out trouble in Iraq and Afghanistan. As a result, K9 Storm in Winnipeg, Canada, makes $5 million a year selling custom armor for dogs in the U.S. Army, Navy, Marines and Special Forces; police departments in 13 countries; and security firms worldwide. Next up, the 12-employee firm is offering a new way to communicate with canines. In 2010 it launches the K9 Storm Intruder, a bulletproof dog vest with a wireless camera, speakers and a microphone built in. The handler can see what the dog sees and issue commands through the audio system. "This will change the way dogs are managed in emergencies," says Glori Slater, 47, vice president and co-founder of K9 Storm. "It will extend the range of the handler to 300 yards." Slater's husband, Jim, is a former dog handler for the Winnipeg police department. For two terrifying days in 1996, he and his German shepherd Olaf helped subdue a prison riot in which the inmates were armed with makeshift weapons. Slater worried more for Olaf than for himself. "He was out working ahead of our lines," he says. "I realized it would be a bad way for him to go down, stabbed with a screwdriver." After the riot, Slater retrofitted a human flak jacket for his canine partner. That prompted orders from fellow canine officers, and soon K9 Storm was in business. The Slaters spent 11 years perfecting the vest. Quality control was crucial, given that a poorly sewn seam can inflict crippling lesions on a dog that's on its paws for 12 hours a day. The Intruder is their lightest camera and audio system, weighing less than seven ounces. The vest is not cheap. The Intruder system starts at $20,000. But the Slaters say they have dozens of preorders. 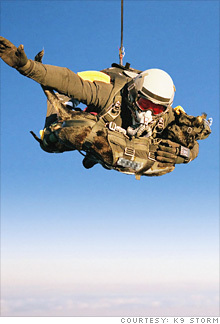 Military working dogs are major investments, costing up to $50,000 each to purchase and train. There also are plenty of donors stepping up to help cash-strapped municipalities buy the vests. Ben Roethlisberger, the quarterback for the Pittsburgh Steelers, gave $250,000 to the Pittsburgh police and fire departments for canine armor. The Massachusetts Society for the Prevention of Cruelty to Animals, which treats 50,000 animals a year, has received a $5,000 grant for dogs at Boston's police department from Roethlisberger. "Suspects pursued by police will stab, shoot and kick working dogs," says Brian Adams, spokesman for the MSPCA-Angell veterinary hospital in Boston. "They are like any officer of the law. We want to protect them."